The Security Guard apologises as he recognises Chrissie but thinks she is Caroline, after he's introduced to Josh he leaves. Helen is telling Paul that Diane (Derek's Daughter) banning her from the funeral, Paul tells her that she should carry on being Administrator for Derek's Scholarship Fund. Caroline enters and apologises again about the computer, she says she will work at Lassiters until she finds another job but now Paul must find somewhere else to live! Cody and Melissa are watching the film, Todd is in the kitchen, he comes back through and Melissa starts kissing him, Cody decides it's time to go to bed. 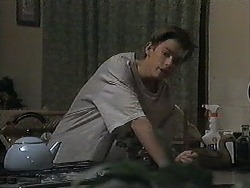 The next morning arrives and Todd is curled up next to Cody as Beverly walks in. They go into the kitchen and he explains to Beverly that he likes Cody but they haven't told Josh and Melissa yet. Beverly says he must tell them soon. Chrissie comes in, she has been out all night, Caroline was worried but Chrissie tells her about Josh, he has fixed the computer, Caroline is delighted. 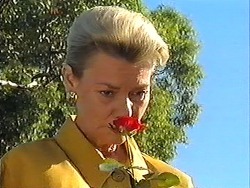 She decides to head in early to impress Paul as Chrissie returns his keys. Caroline is on the computer, he shouts at her for using it but Chrissie tells him that Caroline has fixed it, Caroline doesn't want to take the credit but Chrissie presses on with the story. Paul is delighted. Melissa is impressed with Josh fixing the computer as Cody and Todd come along briefly to say hello. Melissa and Josh agree to meet later so they can study in the park. 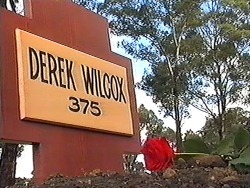 Helen leaves a flower on Derek's grave as some memories flash back in her head. Diane and her solicitor arrive to discuss whether Helen had anything to do with Derek's death. The solicitor asks Beverly whether Derek could have been saved, Beverly thinks nothing could have been done but Diane doesn't believe her. DIANE: I know my father would be alive today if that woman wasn't with him. Chrissie is buying Josh lots of food to thank him for the fixing the computer. 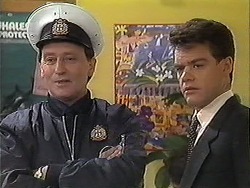 Paul and the Security Guard last night come in, he recognises Josh and the penny drops with Paul. 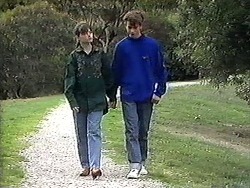 He goes over to Chrissie and Josh, he tells them to be in his office shortly. In reception, Candice asks Josh about how he fixed the computer. Inside Paul's office he is shouting at the twins, Chrissie tries to explain but he isn't listening. He calls Josh in, they all apologise and Paul decides to let it be. He asks Josh how he can repay him and Josh has a favour to ask. 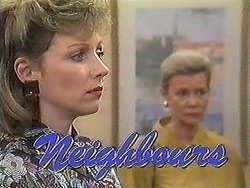 Diane is implying that Helen tricked Derek into leaving her the Scholarship money, Beverly says she can only offer a medical opinion, Helen then arrives at the door. Diane is unhappy that Beverly and Helen know each other. Cody wants to tell Josh and Melissa and says it must be done soon. Todd is putting it off; he manages to convince Cody to leave it for a while. Meanwhile, Josh and Melissa are studying, Josh tells her that Paul has given him a Lassiter's room for the night; he invites Melissa who decides that they should ask Todd and Cody as well. It's clear that Josh wants Melissa to himself. Helen and Beverly are arguing with Diane who thinks they are both lying; the solicitor tries to calm them down but to no avail. Diane says she tricked her father, she lied, the solicitor says she is going to the Police because Beverly could have a malpractice case on her hands.